Living a Fit and Full Life: Snack Happy with Snack Factory's New Dessert Thins! Snack Happy with Snack Factory's New Dessert Thins! For some geniuses their passion and life’s work is the arts. Or, it’s great and awesome advancements in science and technology. Or, for others it may be exploring timeless philosophical notions of the human condition. For us, it’s snacks. Because we’re snack geniuses. Satisfy your sweet tooth cravings without the guilt! 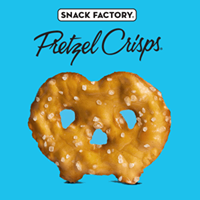 The makers of Pretzel Crisps® invite you to "Rethink Your Dessert"! Snack happy with Snack Factory's new Dessert Thins! 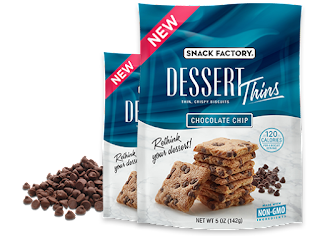 Snack Factory's new Dessert Thins are incredibly delicious and make the perfect light treat when you're craving something sweet. I love that Snack Factory's new Dessert Thins are non-GMO and only contain 120 calories per serving making them perfect for those counting calories. Snack Factory's Brownie Dessert Thins taste just like delicious brownies and I absolutely love the rich chocolaty flavor. Snack Factory's Chocolate Chip Dessert Thins are so good! I only got a few of these because my kids got into them and they only left me a few. 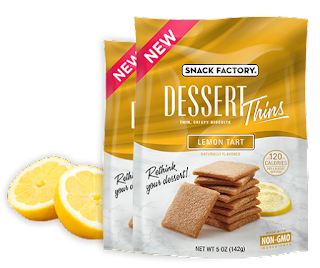 As someone who loves just about anything lemon flavor, Snack Factory's Lemon Tart Dessert Thins were my absolute favorite! They remind me of tea biscuits and would be perfect for any tea party. They have just he right amount of lemon flavor and are absolutely perfect for summer! 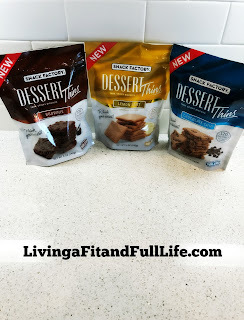 Snack Factory's new Dessert Thins are my new way to enjoy a sweet treat without the guilt and I highly recommend you guys all give them a try! Click HERE to learn more about Snack Factory! Follow Snack Factory on social media!